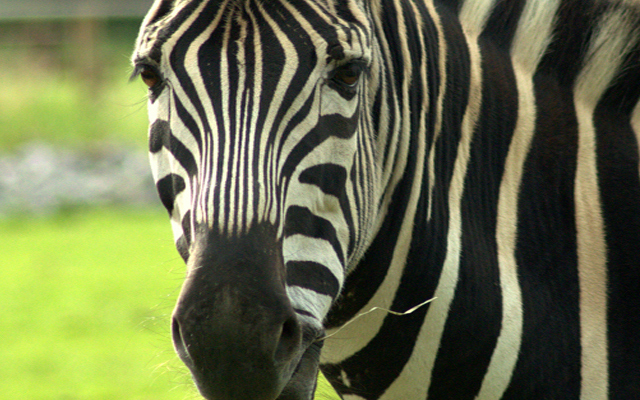 Just like our fingerprints, each zebra’s stripes are unique - no two zebras are exactly alike. Zebras are highly social animals that spend time in herds or ‘harems’ and communicate with high-pitched barks and whinnying. Like horses, zebras commonly sleep standing up and only sleep when neighbours are around to warn them of predators. Zebras feed almost entirely on grasses, but may occasionally eat other plant materials like shrubs, herbs, twigs, leaves and bark. Their digestive systems allow them to live on diets of lower nutritional quality than that of other herbivores. Zebras live in a variety of habitats in Africa, such as grasslands, savannas, woodlands, scrublands, mountains, and coastal hills. Plains zebras are the most numerous of the zebras but unfortunately, populations have declined by 24% over past 14 years. Their IUCN status has now changed from Least Concern to Near Threatened. Their numbers have been reduced by hunting and loss of habitat to farming. You can learn more about the plains zebras' conservation status on the IUCN Red List of Threatened Species website.